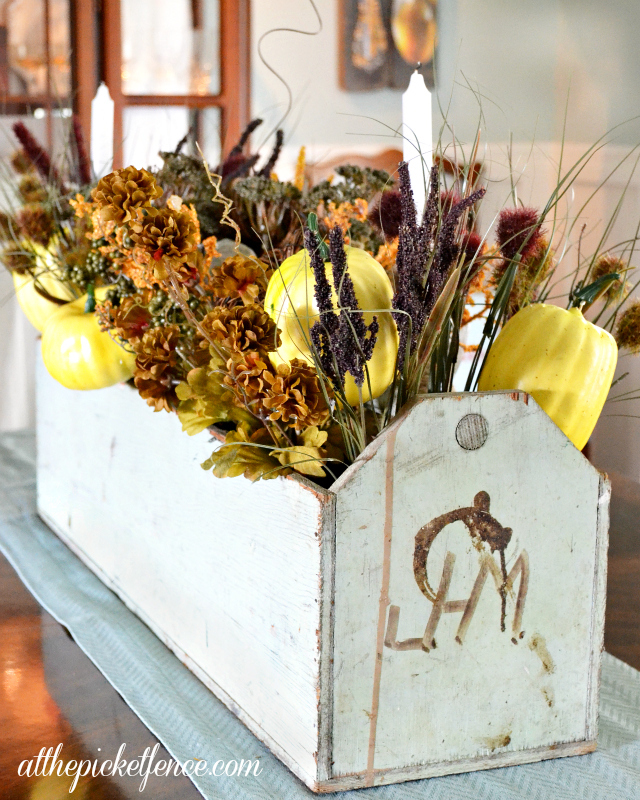 45 Comments on "Vintage Tool Box Turned Frugal Fall Centerpiece"
Thank you Debbie! I got to use my new replacement camera today for the first time. I did an upgrade and noticed a big difference. love it!! and those perfect burlap candles!! 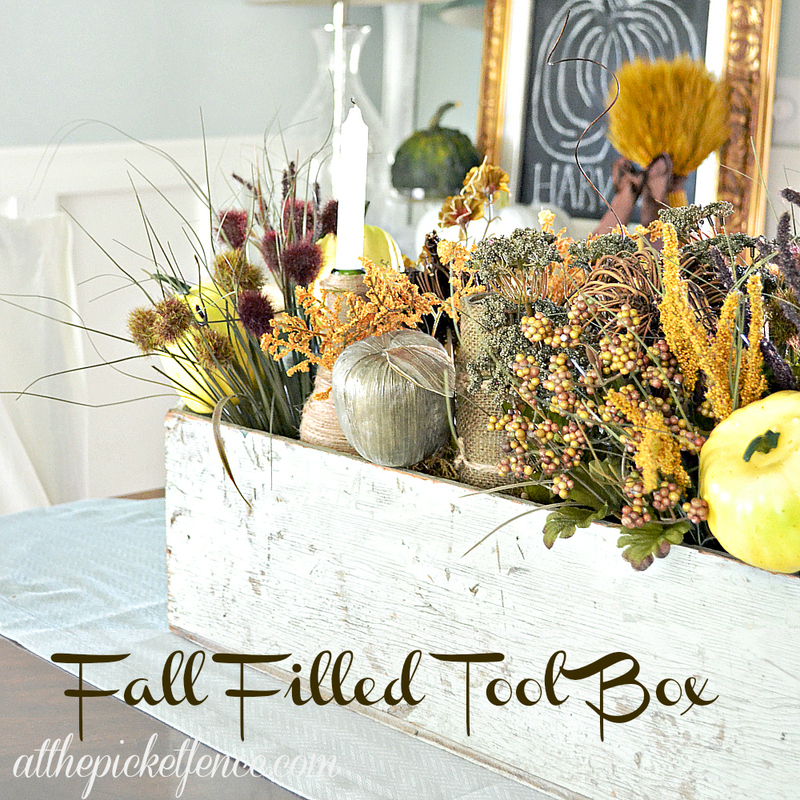 What an awesome tool box full of a lovely fall display! I love it! Just gorgeous! Love every detail…I have been on the lookout for a similar toolbox. Your whole display is gorgeous and so frugal. You never know – John Max Carl could have been in touch with his inner fashionista! 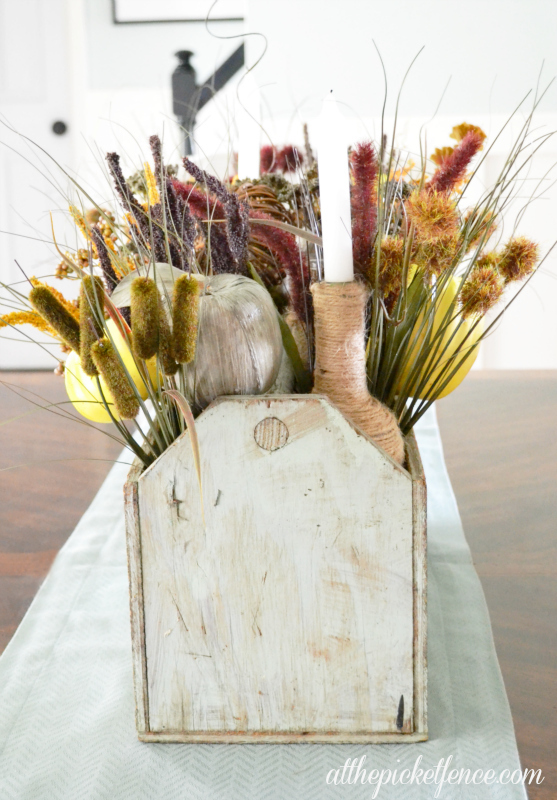 Love your found toolbox – I think it’s the long lost twin of mine which is also sitting on my dining table! Love those twine wrapped candleholders! It looks gorgeous as a centerpiece. I love every detail. What a great look. Wow this is gorgeous, how I wish I could arrange flowers and candles to look even half this good. The tool box- amazing idea. Beautiful!! Love it and your photos! Love it! 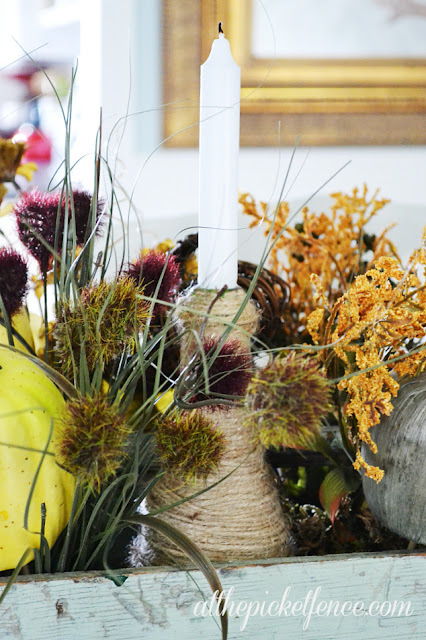 What a perfect fall centerpiece! You are so stinkin creative and who would of thought all of the fillers were from the Dollar Tree. Awesome Heather and again your photos are beautiful!! John Max Carl would be thrilled what you did with his tool box! I love all of the Fall goodies you placed inside. 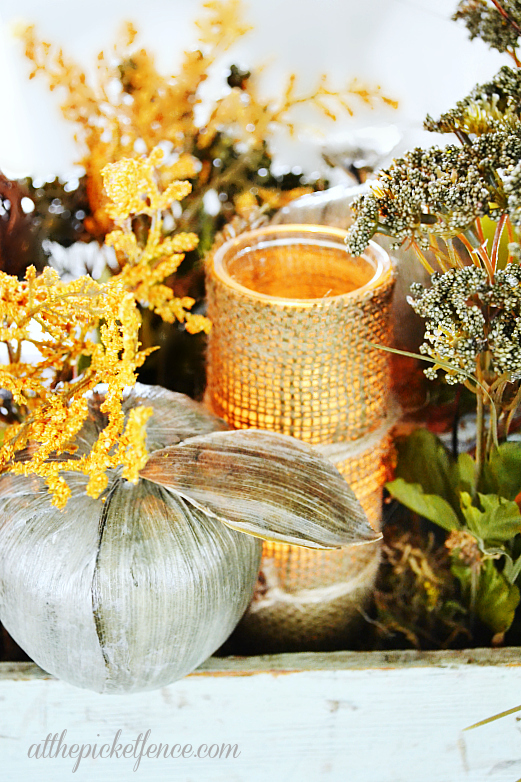 And, the candles are fabulous … Dollar Tree would be proud! So cute- I love old toolboxes and have a couple myself. They are so charming for so many different displays. Love yours and your story!! Fabulous ! Love it ! very interesting, when i look at the letters what i see is … J H M. lol. oh well, it doesn’t really matter does it? 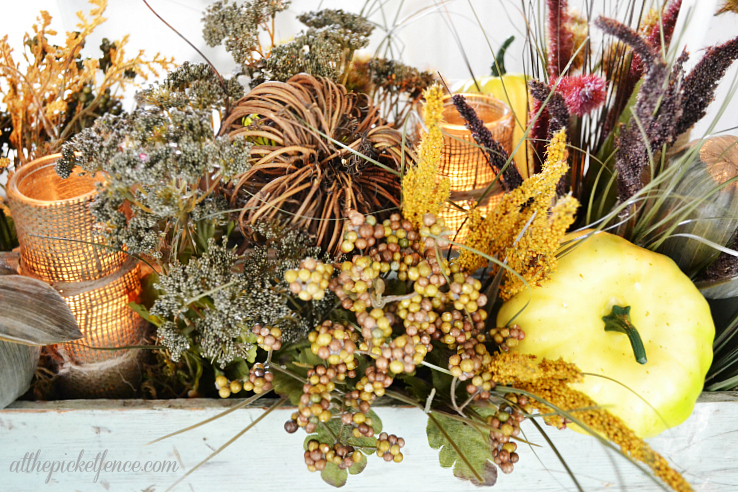 your arrangement is Gorgeous! 😉 thanks for sharing! Adore you toolbox! It has such an interesting mix of “ingredients” and textures! I have my Daddy’s toolbox, (along with some of his tools) which I plan to decorate this year. You are in inspiration! Just a beautiful use of such a great box. I love all the items you used to fill this with. Gorgeous!! 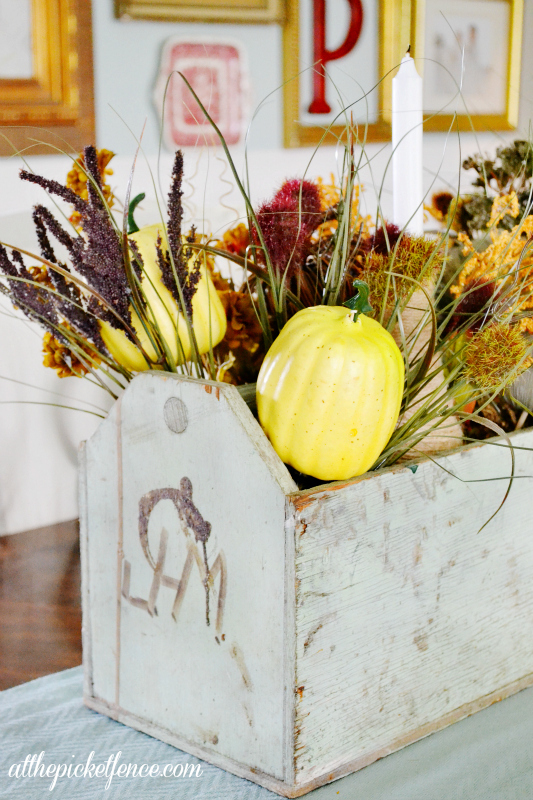 Your toolbox looks amazing all decked out for fall. I also love that you added candles. You just can’t have enough of them this time of year. I absolutely love how you styled this tool box!! I am so inspired! My husband’s great-uncle built him a wooden toolbox just like this when we were first married. It’s so special and I’d much rather use it in the house than for tools. I LOVE how yours looks with the whitewash and the letters preserved….so cool! That is simple and gorgeous! So pretty, Heather! 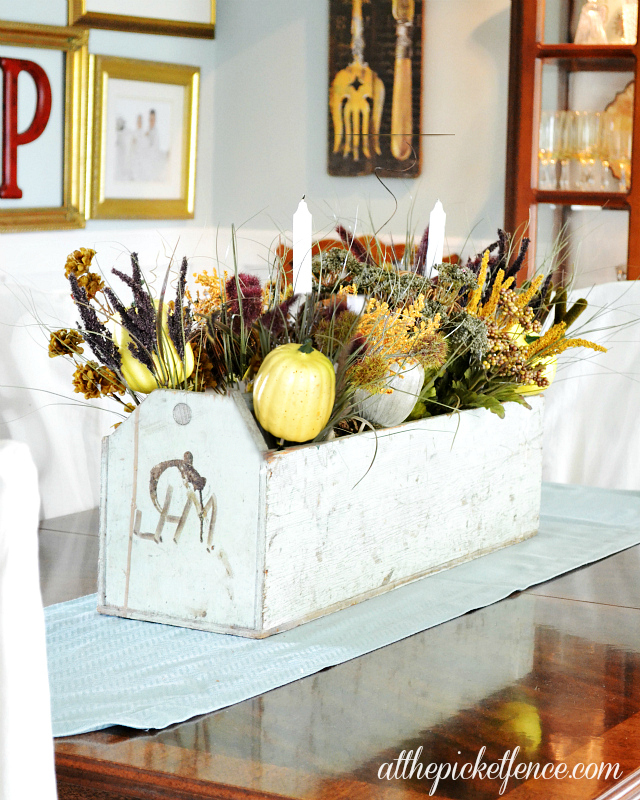 I love the burlap-covered glass jars–will have to try that out! Love your centerpiece! So beautiful! Happy Fall! Everything is just beautiful! Love it!! Absolutely beautiful with that warm, rustic feeling. What a beautiful center piece!! LOVE those colors!! Great photos! I felt the same way about my Homers toolbox. I completely understand! oops I mean from Potpourri Party…. So beautiful! You came up with a great display. Thanx for coming to THt!